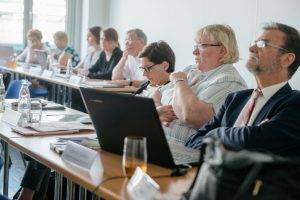 The Expert Conference of the Job Developer project entitled Creating New Jobs in the Context of Youth and Long-term Unemployment in Europe and Digitisation took place from 6th to 7th June 2018 at the Technology Center and the IAW of the Ruhr-University Bochum. There were 30 participants from different institutions. Including representatives of the project partners, the IAW and the minientrepreneurs as well as experts. Dr Peter Hartz from the SHS Foundation in Saarbrücken began with an insight into the further development of the labour market reform in Germany. Afterwards Dr Martin Kröll on the challenges, central questions and the approach of the Job Developer project in the light of whether the project contributes to the reduction of youth unemployment in Europe. After a coffee break the presentation on the concept of minipreneure in a European context by Dr Sascha Göttling from the SHS Foundation. The vision is a Europe of minipreneurs. This was followed by a lecture by PHD Joachim Wolff from the IAB Nuremberg on the effectiveness of active labour market policy for the long-term unemployed in Germany and recent reform proposals. The initial question was whether active labour market policy really improves the employment situation. This was followed by the lecture titled “Strategies for Reducing Youth and Long-term Unemployment” by Dominik Schad, the head of the Job Center from the district of Recklinghausen. Afterwards the lecture of Dr Judith Aust, the managing director of the bag arbeit e.V. from Berlin on “Labour market policy for the long-term unemployed – shaping participation”. 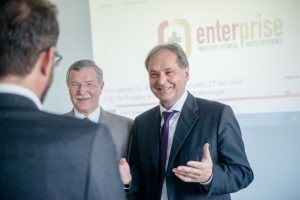 Subsequently, Heinrich Bär, the coordinator of the Ausbildungsbrücke in Lüneburg, talked about the integration of young people into the labour market with the help of the training bridge as a sponsorship model of Diakonie. He called his talk a “report from the grassroots and the problems there”. The sponsorship model is divided into the training bridge for pupils and the job bridge for the long-term unemployed, disabled and inmates (special project Bavaria) as well as refugees (special project Lüneburg). Subsequently, Artemis Saitakis, one of the Greek project partners, gave a lecture entitled “New employment opportunities in the context of digitisation. His thesis was that digitisation would lead to more people becoming self-employed. The second day of the Job Developer Final Conference started with the presentations of the project partners from the individual partner countries for the implementation of the Job Developer Project with regard to the country-specific features and individual problem-solving approaches. Elisa Mochizuki from CEEIM started with her presentation on the implementation experience in Spain. Subsequently, Krisztina Erdős-Pohli from the Chamber of Commerce Pécs-Baranya presented the Hungarian implementation experience and project results. Darina Baycheva from the Gabrovo Chamber of Commerce then presented the implementation experience and project results from Bulgaria. Afterwards, Athanasios Vourlas from Eniochos.Consulting spoke about the project implementation in Greece. Subsequently, Aistė Litvinaitė from the Vilnius Chamber of Commerce, Industry and Crafts presented the implementation experience from Lithuania. After the presentations of implementation experiences in the partner countries, there was a one-hour lunch break. With fresh heads, the attendees started the workshops on the topic “Sustainable impact”. Afterwards, the next steps regarding the project management under the guidance of Kristina Burova-Keßler were discussed. These included the final report, the intellectual output, and financial management and administration. Aistė Litvinaitė (Chamber Vilnius):Implementation in Lithuania. Entrepreneurial creativity, ability to communicate and trends. As part of this, suggestions for further ideas and developments of these modules have already been collected. 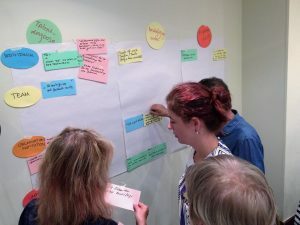 The following discussion generated ideas on possible IT solutions for the self-learning modules and which of the self-learning modules can be digitised. It was discussed what experiences the partners have in this regard. The suggestion came from Spain to use the project experience to connect the target groups “multiplier / mentor” and “young people”. Videos and tutorials for the young people as well as overview and feedback possibilities for the multipliers could be offered. die Lithuanian branch of the Vilnius Chamber of Commerce, Industry and Crafts. In addition to the presentation of all partners and their regional situation in terms of youth and long-term unemployment, the IAW focused on the presentation of the project itself.